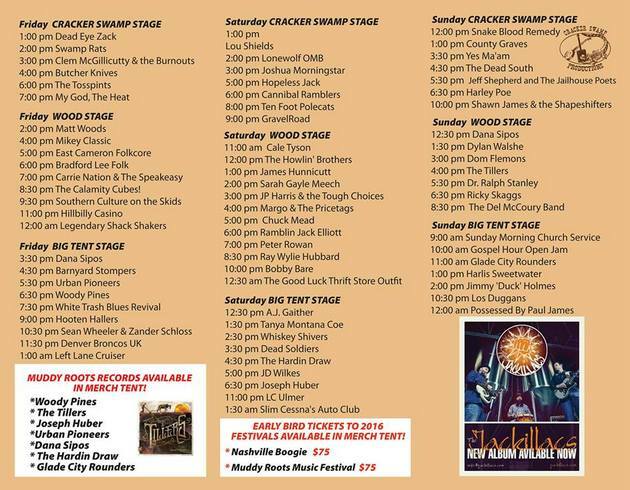 The Muddy Roots Festival is gearing up for its 5th annual event in the rolling hills just outside of Cookeville, TN, about an hour or so from Nashville to the east for the upcoming Labor Day weekend, and boasts an impressive lineup of many country and bluegrass legends, including Del McCoury, Bobby Bare, Ricky Skaggs, Ralph Stanley, Ray Wylie Hubbard, Peter Rowan, and an impressive under card of insurgent roots artists such as Th’ Legendary Shack Shakers, Possessed by Paul James, and Southern Culture on the Skids. 75 bands in all will play the event which offers free camping and BYOB privileges for patrons. Festivals have been a big topic in the news this summer with so many new festivals popping up, some high profile cancellations of festivals and last minute cancellations of appearances. The festival landscape is becoming crowded very quickly, especially in middle Tennessee, but Muddy Roots promoter Jason Galaz is grateful to have established his festival over the last few years. What is Jason Galaz most looking forward to at this year’s Muddy Roots Festival? “Knowing that this Sunday I will hear Del McCoury sing ’52 Vincent Black Lightning’ on our wooden stage in a field 20 minutes out of town.” He says the festival, just one of many events Muddy Roots throws throughout the year, including the Nashville Boogie Vintage Weekender set for next year in May at the Gaylord Opryland and Grand Ole Opry House, and a European version of the festival, is all part of a greater effort. But this Labor Day weekend the focus will be in Cookeville for the three day event as independent roots fans from all around the country, and even some from around the world gather to celebrate the music. Wow. What a great lineup this is. Wish I could go. A lot of these acts were at Whispering Beards last weekend. I will definitely try to make that one next year. 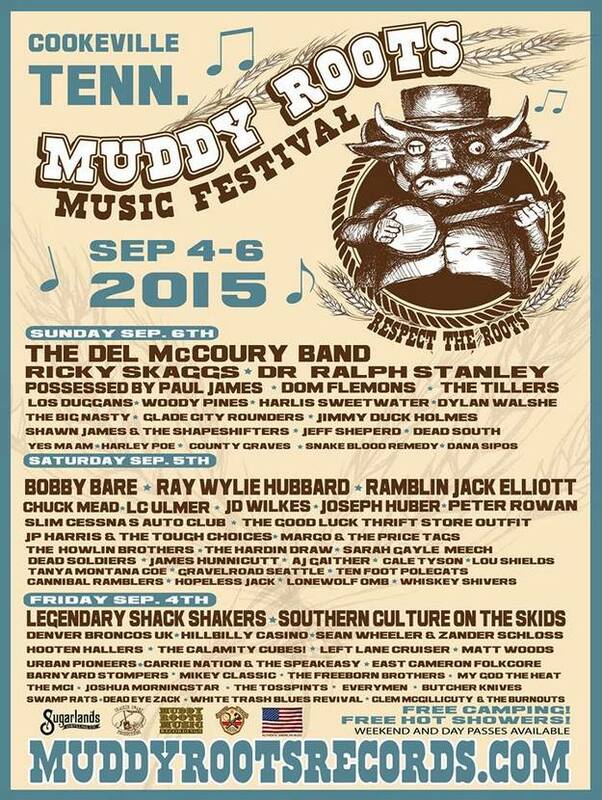 Ricky Skaggs, Del McCoury and Ralph Stanley? In one evening?! Bluegrass heaven right there, my friends. Not to poop on the party with such an amazing line-up but anyone notice the staggering lack of women? Banner ads now take up 1/3 of the screen on mobile. Can you ask for donations before resorting to this? Love the site and will contribute, but the new ad format will cause me to avoid SCM on mobile going forward. Very sorry if you’re having an issue with the ads. That’s certainly not what I’m seeing, and that’s certainly not what the ads are supposed to be doing. I was having the same issue until yesterday. I’m on an Android phone. It updated last night, and since the update, things are fine. Okay, thanks for the info. We’re looking into it. Obviously it’s not the intention to have huge ads getting in people’s way and discouraging folks from reading. Awesome line up! I wish I could be there. Good to see the legends getting there recognition at festivals like this. This show the clear distinction between real music and what kids listen to on the radio today. I’m glad to see that Hopeless Jack and the Handsome Devil making it to Muddy Roots. I saw them in Portland with the Urban Pioneers before I deployed to Okinawa. Both awesome bands. Hopeless Jack puts on an a rockin’ show. Keeps the torch that Hillstomp passed down to them burning bright in the Deep Blues from Portland. I know we already have too many name conflicts in this scene, but there’s something really all-inclusive about “Genuine Country”. I dig it. it was AMAZING! I saw a ton of amazing music those four days, and Peter Rowan, Ray Wylie, and Del McCoury all blew me away. thanks Jason Galaz!! !